Volodymyr Semynozhenko has visited NTUU "KPI"
Volodymyr Semynozhenko - the head of State Agency of Ukraine on Science, Innovation and Information, academician of National Academy of Sciences of Ukraine (NAS) visited NTUU "KPI" on April 4 - press service of NTUU "KPI". 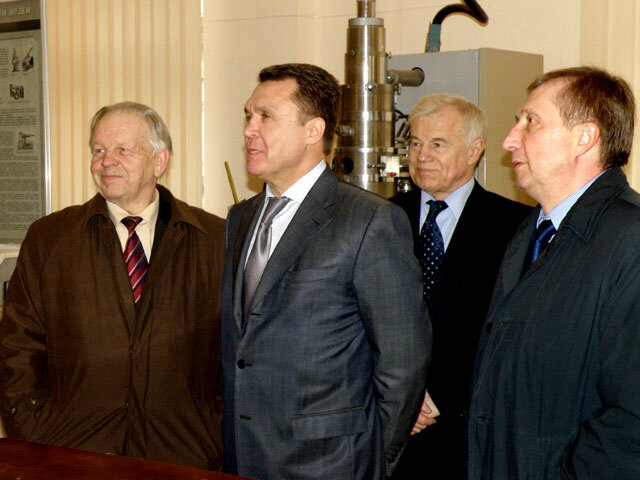 Semynozhenko visited the exhibition of the State Polytechnic Museum of KPI, got acquainted with the history and reality of the University and met with heads of the Kiev Polytechnic University. Modern concept of research university based on education - science - and innovation (the triangle of knowledge proposed by the European Union) was discussed during the meeting. V. Semynozhenko said that Universities in Ukraine have to acquire the status of research and innovation institutions, as it is a source of highly qualified personnel. Also during the meeting, the changes and amendments to the draft law on higher education suggested by the University were discussed. Among them were the promotion of science in universities, autonomy and licensing of universities, independent verification of education quality and so on. Also a group of NTU "KPI" innovative research projects which have national significance and are performed through international cooperation was presented. Among them: Ukrainian Research and Academic Network (URAN), the concept of creating a national Foresight center, World Data Center for Geoinformatics and Sustainable Development (WDC-Ukraine), which operates since 2006 on the basis of NTU "KPI" and belongs to the World Data System of International Council for Science. The meeting was attended by rector of NTU "KPI", academician of National Academy of Sciences of Ukraine (NAS) M. Zgurovsky, first pro-rector of NAS of Ukraine Y. Yakymenko, vice-rector on scientific work corresponding member of NAS of Ukraine M. Ilchenko, prof., dr. D. Pankratova, director of WDC-Ukraine K. Yefremov and others.